52 < m ETRO m AGAZINE FACT BOOK 2015 metro-magazine.com bus & chassis manufacturers Denotes advertiser Midway Specialty Vehicles LLC P.O. Box 1931 Elkhart, IN 46515 (574) 264-2530 (574) 264-5630 Fax gmathers@mymidway.com www.mymidway.com Gary Mathers, CFO Russ Gilpin, VP, sales Mike R. Violi, Pinnacle sales Midway manufactured buses use the Sprinter chassis. The Midway Pinnacle Sprinter Bus is powered by a diesel engine rated at an economical 20 miles per gallon. Maneuver- ability and a tight turning radius make this an excellent shuttle for hotels, airports, parking lots and assisted living facilities. Passengers are aforded a wide entrance door, excellent visibility, and either forward facing or perim- eter style seating. Buses will accommodate physically challenged passengers and satisfy ADA requirements. Mobility Ventures LLC 105 N. Niles Ave. South Bend, IN 46617 (877) 681-3678 Email: info@mv-1.us www.mv-1.us Rick Smith, pres. John Walsh, VP, sales & mktg. The MV-1 is the frst factory-built ve- hicle designed for universal accessibility, specifcally to accommodate wheelchairs. Each MV-1 rolls of the assembly line with a side-deployed powered ramp and spacious interior, with the promise of unrivaled dura- bility. Proudly made in the U.S. by Mobility Ventures LLC, a subsidiary of AM General. 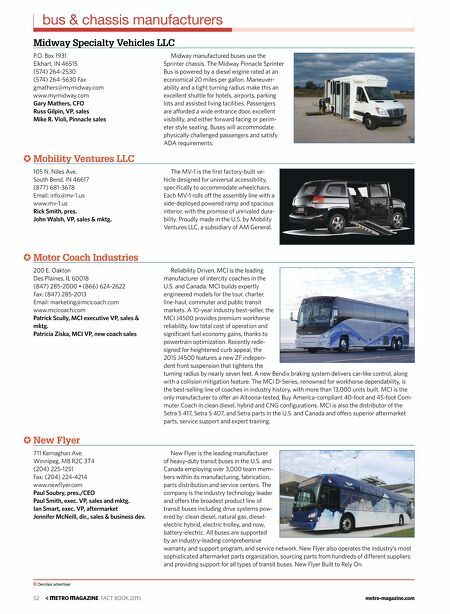 Motor Coach Industries 200 E. Oakton Des Plaines, IL 60018 (847) 285-2000 • (866) 624-2622 Fax: (847) 285-2013 Email: marketing@mcicoach.com www.mcicoach.com Patrick Scully, MCI executive VP, sales & mktg. Patricia Ziska, MCI VP, new coach sales Reliability Driven, MCI is the leading manufacturer of intercity coaches in the U.S. and Canada. MCI builds expertly engineered models for the tour, charter, line-haul, commuter and public transit markets. A 10-year industry best-seller, the MCI J4500 provides premium workhorse reliability, low total cost of operation and signifcant fuel economy gains, thanks to powertrain optimization. Recently rede- signed for heightened curb appeal, the 2015 J4500 features a new ZF indepen- dent front suspension that tightens the turning radius by nearly seven feet. A new Bendix braking system delivers car-like control, along with a collision mitigation feature. The MCI D-Series, renowned for workhorse dependability, is the best-selling line of coaches in industry history, with more than 13,000 units built. MCI is the only manufacturer to ofer an Altoona-tested, Buy America-compliant 40-foot and 45-foot Com- muter Coach in clean diesel, hybrid and CNG confgurations. MCI is also the distributor of the Setra S 417, Setra S 407, and Setra parts in the U.S. and Canada and ofers superior aftermarket parts, service support and expert training. New Flyer 711 Kernaghan Ave. Winnipeg, MB R2C 3T4 (204) 225-1251 Fax: (204) 224-4214 www.newfyer.com Paul Soubry, pres./CEO Paul Smith, exec. VP, sales and mktg. Ian Smart, exec. VP, aftermarket Jennifer McNeill, dir., sales & business dev. 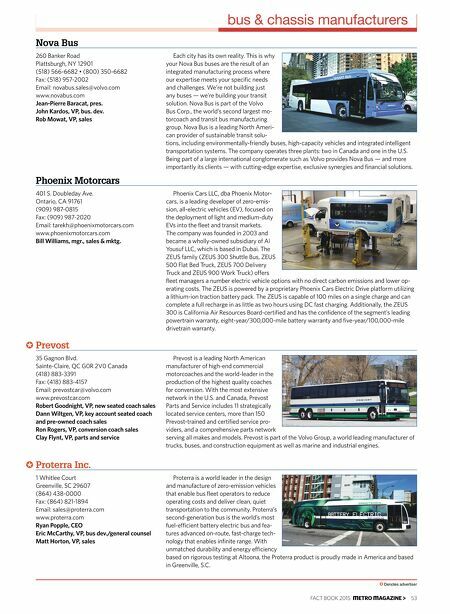 New Flyer is the leading manufacturer of heavy-duty transit buses in the U.S. and Canada employing over 3,000 team mem- bers within its manufacturing, fabrication, parts distribution and service centers. The company is the industry technology leader and ofers the broadest product line of transit buses including drive systems pow- ered by: clean diesel, natural gas, diesel- electric hybrid, electric trolley, and now, battery-electric. All buses are supported by an industry-leading comprehensive warranty and support program, and service network. New Flyer also operates the industry's most sophisticated aftermarket parts organization, sourcing parts from hundreds of diferent suppliers and providing support for all types of transit buses. New Flyer Built to Rely On.